Today I am going to show you a really pretty but super summery and pretty manicure I have been wearing this week. 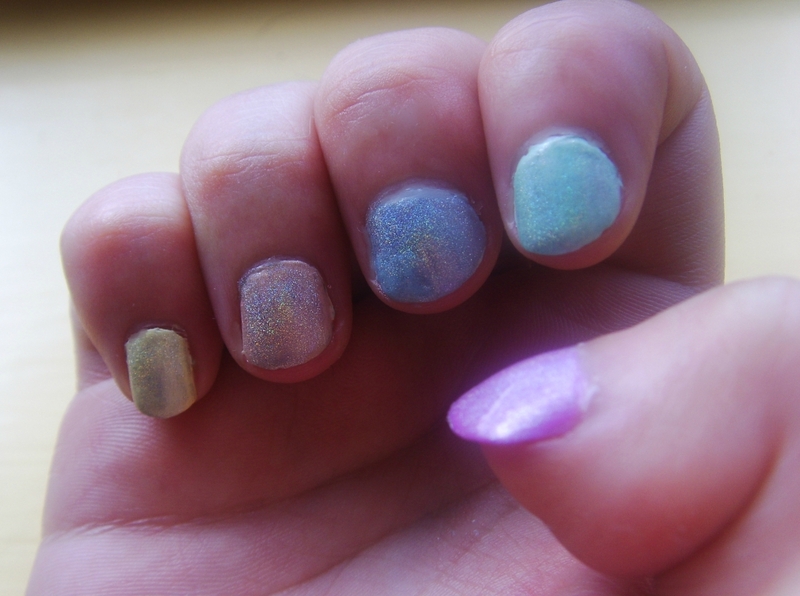 When sorting through my untried polishes I noticed a number of pastels so I decided to skittle them together. The colours are quite subtle yet at the same time very girly and chic and perfect for summer. From left to right we have HITS Powerpuff Girls Lovely, Docede Leite, Barry M Blue Moon, HITS Powerpuff Docinho and Barry M Limited Edition. 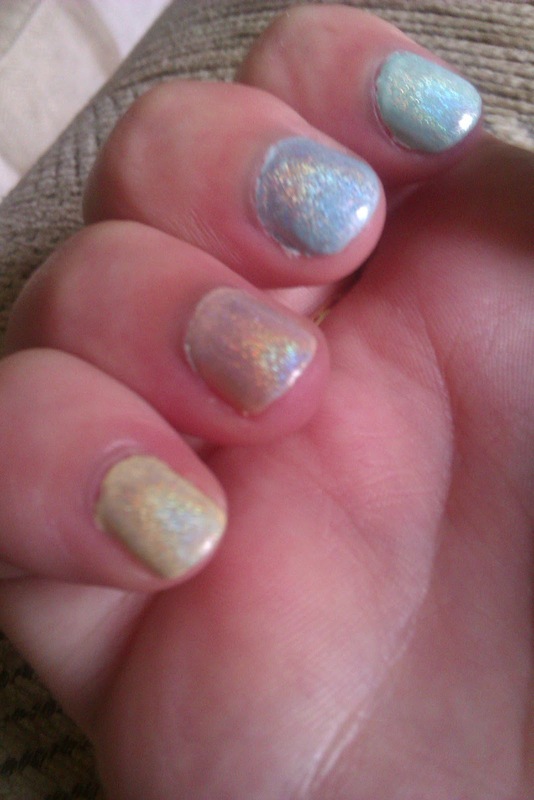 I used three coats of Lovely and two coats of all the others. I really love the shades of all of these and they go together really well. I then topped everything with a coat of Ozotic 509 a sheer silver holographic (almost a holographic topcoat polish). 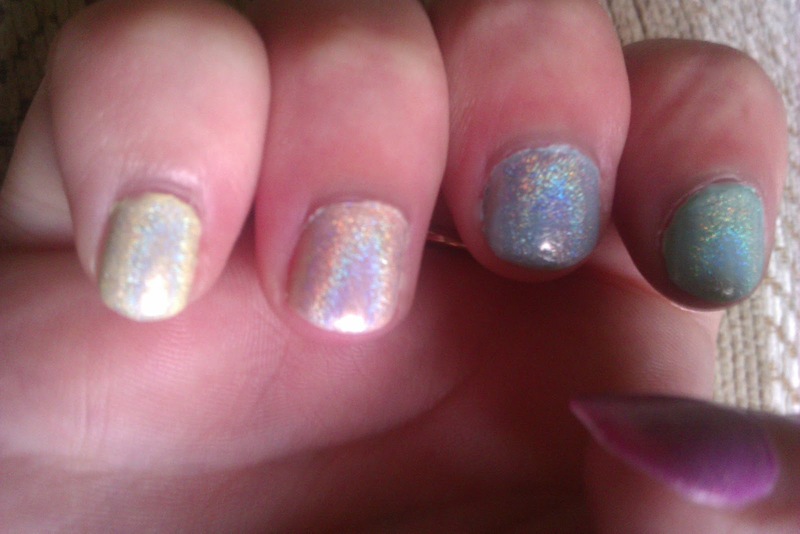 The holographic topcoat changed the shade slightly. When not in the light it gives a almost sugary slightly 'off' coloration which I quite liked. In the sun however this manicure had a life of it's own. Linear holographic galore! Sadly I couldn't completely capture it's beauty! I think my favourite is Docede Leite with the holographic topcoat, as I always say I am not a fan of neutral polishes but with the holographic it looks amazing! So subtle and feminine! What do you think? Do you like pastel polishes? What are you fav summer shades? holo ice cream! So very pretty! I'm currently having a love affair with pastels (in the middle of winter here!) I love these, they look great! I will have to try it when there is a little bit of sun to see the holos! I just saw these on your pinterest! I love it, very cool idea!